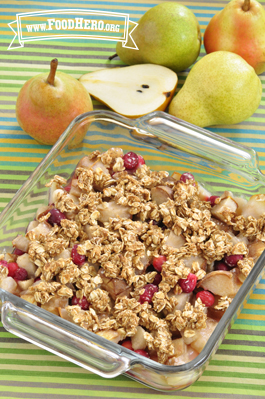 2 Comments for "Pear and Cranberry Crisp"
This recipe is such a great combination of tart and sweet flavors! What a great treat! I found that there really isn't any need to add the cornstarch. Also, depending on your oven, it may take up to 45 minutes to cook. Super quick treat! And great when you have a lot of pears as we did. I swapped the applesauce out for oil as i made this the night before and i figured the applesauce in the topping would hold over better, and then for cranberries my little kids don't like tart taste too much so i used dried cranberries. Everyone enjoyed it!